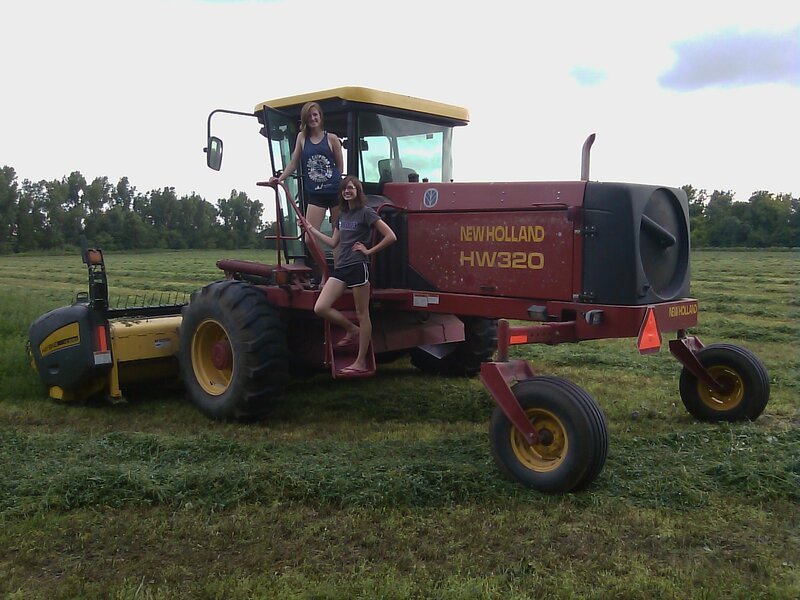 Kids, Cows and Grass: Girls driving tractors--boys too! Hay season has officially begun in Kansas! That may not seem like a milestone to most people, but to a cattle rancher, that is an important day. We have cut, and are ready to bale, the alfalfa hay for the first time this season, and the first field of brome hay has been opened up. This is the beginning of a long month of hours/days/weeks on the tractor preserving the grass for the cattle to eat all winter. For the next few weeks, I will spend 6-8 hours a day on a tractor baling hay, while my kids will spend nearly as much time on the swather, rake or tractor hauling hay. We are a family ranch and that means that the family pitches in and does all the work. Before our kids are old enough to have a drivers license, they are driving tractors that are more costly than most cars. They assist in hauling and stacking the big round bales of hay to store it for winter. We believe it is important for our kids to be involved for a number of reasons: they learn to physically work hard, use their muscles and their brains; they earn the sense of accomplishment of a job well done--not just hollow praise; and they learn that cattle ranching is not all tagging calves and checking pastures. There are lots of jobs that are not particularly easy in ranching, and with most of them, you can get very dirty! We hope that our kids will want to continue the ranching legacy and that we will be able to pass this land and ranch on to them, but for them to make that choice, they must know what they are getting themselves into. Baling hay is not my favorite spring/summer activity, so I have to remind myself of the beauty of the chore. The pictures above show the view from our front porch--the brome grass seems to be smoking. That is the pollen swirling on the Kansas wind--a vital part of raising grass! As long as I remember to take my allergy medicine that day, I can enjoy this sight. Once the brome "smokes" we prepare to cut it for hay. It is important to cut it at the right time to ensure good quality hay with an adequate protein content for the cattle, but also enough leaves to get good tonnage--plenty of hay! As the season progresses and the weather gets hotter, the quality goes down, but the tonnage goes up. Everyone gets into the act. Usually the oldest available kid will run the swather that cuts the hay. A swather is called that because when it cuts the hay, it drops it into a piled up row, called a swath. That swath can't be too deep as the deeper the swath, the longer it takes for the hay to dry. If the hay is very thick, we will widen the swath. 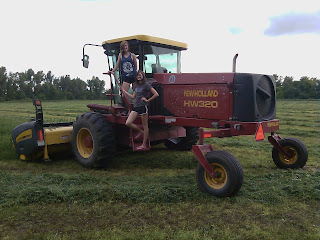 In the past, my daughters have run the swather, but this year they both have "off-farm" summer jobs, so the head swather will be my 16 year old son. The 14 year old twin boys will be in charge of raking the hay so I can bale it, and they will also drive the tractors to haul the hay bales I've made out of the field to the stacks where they will be stored for winter. My husband does work in town during the day, but that doesn't mean he isn't involved too! He will jump in to whatever job needs doing when he gets home from work, or on the weekends you will find him in the hay field. Feeding cows is a year-round job--whether we are storing the hay or feeding it to the cows. During June, we'll be cutting hay every day that it doesn't rain. I'll try to keep up with blogging, but if I don't, you'll know that I couldn't find room for the laptop on the tractor! Awesome post. Since my family's farm was smaller, we always bought all of our hay. I love learning more about all the feed that my cattle eat, whether it is hay or grains. I never new that brome "smoked!" Nice hay fields! I enjoy the hard work of baling hay in the summer also. It's one of the many joys of being a country girl! I enjoyed reading about your hay harvest. My husband and I do all our own baling since we only had girls and they are grown with families of their own. We usually get three cuttings from our fields. This year we haven't had measurable amounts of rain since March and so we've only cut once and have had to start feeding some of it since the pastures have dried up. We've sold several calves, and if we don't get rain soon, will have to sell some cows. I rake; I haven't baled with the round baler but used to run the square baler. By the way, I saw the story about you in Progressive Farmer, and told my husband, "I know that woman!"